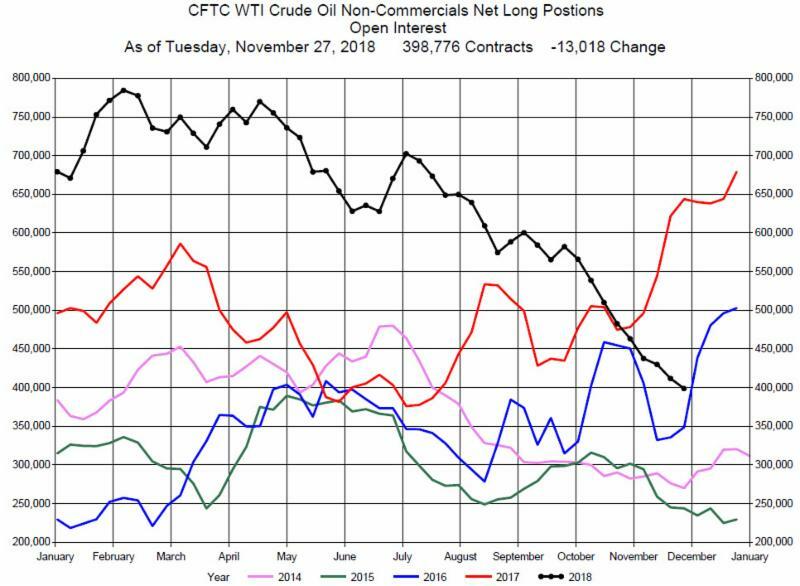 The latest CFTC Commitment of Traders Report as of Tuesday, November 27, 2018 shows the Non-Commercials Net Long Positions decreased during the week by 13,018 contracts to 398,776 contracts. 14,554 Long positions were closed and 1.536 Short positions were covered. This is the ninth consecutive week since the end of September that the Funds have reduced their Net Long Positions. Last Friday, during a shortened trading session the December Crude Oil contract had a significant down move of over $4 to $50.42 extending the bear market. There have been news reports that the Russians would like to cut production in conjunction the Saudis to stabilize and increase crude prices. The Saudis need higher prices, but an increase in prices will encourage US shale production and a political reaction from the US. Higher prices will also cause the Saudis to lose market share. An OPEC meeting in Vienna is scheduled for December 6 so the market will be driven by headlines. With the geopolitical uncertainty and high price volatility we recommend consideration of being on the sidelines.